Home / Rental Equipment / Floor & Wall Finishing / TILE SAW, 4 3/8″ ELEC. TILE SAW, 4 3/8″ ELEC. This Handheld Ceramic Tile hand held cutter MK-70 is both compact and versatile. Use it to cut a variety of material. Its unique adjustable base easily allows you to change both the cutting depth and cutting angle. Use it for cutting tile, brick, block, concrete, stucco and fiber cement siding. Adjustable base permits varying both cutting depth and cutting angle. Water hose attachment for wet cutting. 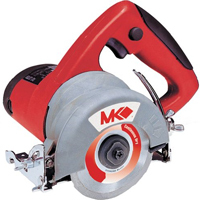 Suitable for cutting tile, brick, block, concrete, stucco and fiber cement siding. 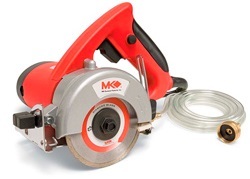 Includes 4″ continuous rim and turbo rim diamond blades. UL approved.